Recently, there is much debate in the US about voter ID laws. Briefly, these are laws that require voters to have certain kinds of ID (such as government-issued photo IDs) in order to vote. While this may sound natural and straightforward, many people – particularly poor minorities- do not have such IDs. The IDs can cost money, and they can be difficult to obtain (for example, if the nearest office is 150 km from your home). Since the types of voters unlikely to have these IDs are more likely to vote Democrat, Republicans support these laws and Democrats oppose them. Each side finds a moral justification for their position, though you can be sure they would reverse positions if the stakes went in the opposite direction. Republicans say that we must prevent voter fraud, and cite historical examples of dead people voting. Democrats say that such laws disenfranchise minorities and are a form of discrimination, citing a long history of poll taxes and other supposedly “neutral” ways of preventing poor blacks from voting. Both sides have at least a kernel of truth to their argument, but both sides also miss something critical: that elections should reflect the will of the people. 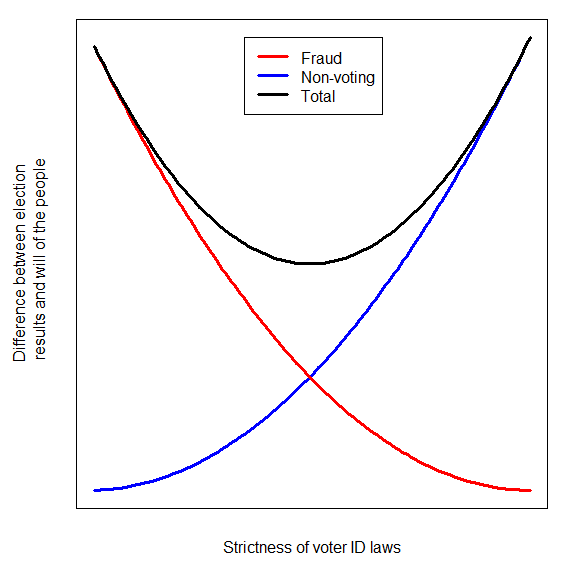 A statistical perspective on elections provides a clear way to evaluate what voter ID laws we should accept. Let us take as a given that the goal of democracy is to form a government that reflects the will of the people, as expressed by their votes. If we believe this, we should try to structure our laws so that the outcomes of elections will best reflect the will of the people, writ large. The particular way we vote – one person one vote, with representatives, etc – is one way to achieve this, and there are others which are likely better. But we are not going to revamp the entire structure of government today, so we’ll leave intact our basic system and try to arrive at voter ID laws that will best allow election results to reflect the popular will. Unfortunately, there are a number of problems in trying to determine popular will through elections. To my mind, the biggest is that people may know vaguely what they want from their government, but, in the haze of manipulative ad campaigns, it is very hard for them to assess how their votes will correspond to getting the government they want. In statistical terms, this introduces a lot of error in measuring the will of the people (inaccuracy without a particular bias one way or the other), and will likely also introduce bias if one campaign has more money or more talented campaign staff than the other. But this is another problem we can’t tackle today. There are two problems we can tackle. The first is voter fraud – people voting twice, “dead” people voting, foreigners voting, manipulation of results by the parties, etc. There certainly is a history in the US (and many countries) of voter fraud, and on a large scale this can certainly tip elections. Look at Russia and Iran. We don’t want to go there. On the other hand, if lots of people who are eligible to vote don’t, this can also create a problem in how well the elections reflect the will of the people. To the extent that the non-voters don’t care, perhaps it is appropriate that we don’t take their opinions into consideration, but to the extent that there were practical barriers to them voting (a difficult work schedule, lack of proper ID, intimidation), the election result will less accurately reflect the people’s will. 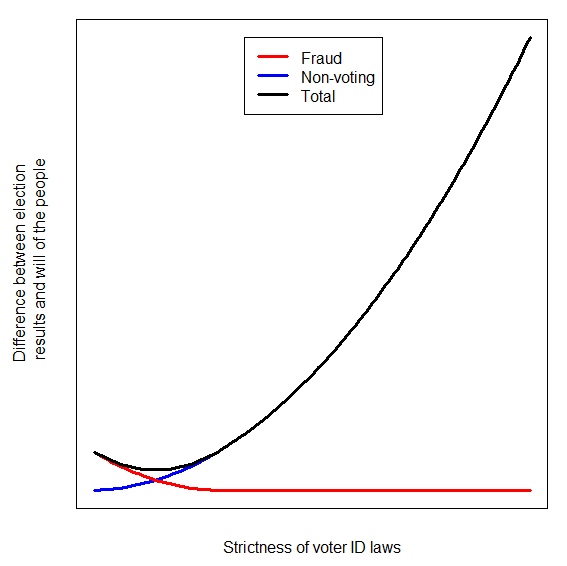 The problem is that, in the real world, strict voter ID laws decrease fraud but also create barriers for voters. There is a trade-off between these two goals. The appropriate question is not which side is right, but rather what is the appropriate balance. Luckily, this is an empirical question rather than a moral question (even if we may not have the perfect data to respond to it precisely). 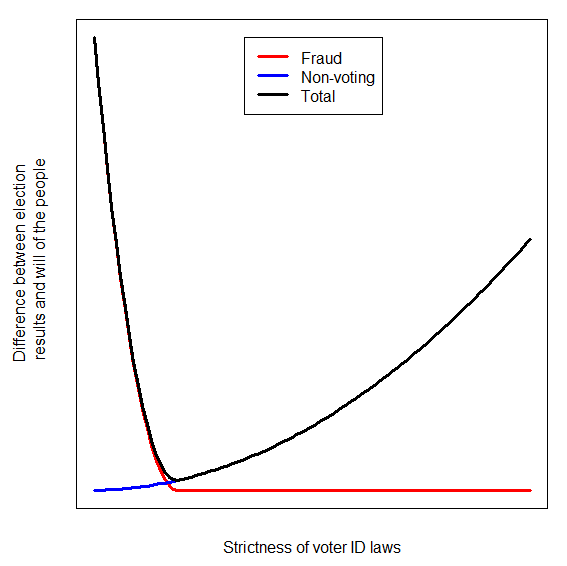 As the laws get stricter, we have less voter fraud but more problems with non-voters. The best overall outcome is reflected by the minimum value of the black line (which is the sum of the red and blue lines), at an intermediate level of strictness. Alternatively, in a modern democracy with both parties verifying the results, perhaps the total sum of individual fraud would never be very high, in which case we might get the pattern shown in the figure up top. I don’t know what the optimal balance is. I do know that we have enough data to make a reasonable guess and to get pretty close. And I do know that this balance, in the current US system, is toward the left of this graph, with much less restrictive laws, as shown in the two asymmetric graphs. This conclusion agrees with what many on the left have been saying, but there is a subtle and important difference in my persepctive from theirs. People on the left complain about the individual loss of rights that accompanies disenfranchisement. While I agree that this is not ideal, I have a greater problem with the population problem of not properly determining the will of the people. (The people on the right also complain about the individual-level problem of fraud). If the balance were to change such that fraud became a bigger problem, I would switch sides. So this post returns to one of my favorite themes: Americans take too individualistic a perspective. In the bigger picture, there is no perfect system. There will be some fraud and some disenfranchisement. The goal should be to minimize the total harm from both. What do you think? Is individual disenfranchisement or individual fraud a bigger concern than getting the results of the election right? If so, how does this affect our conception of what democracy is? I think individual disenfranchisement is the bigger issue. If you disallow people to vote then apathy and ignorance sets in. Why do a lot of 17 year olds not know anything about the election? because they can not vote so it does not matter to them per-say but more 18 year olds are knowledgeable because they can vote. So if you take away peoples right to vote they will become apathetic and then ignorant. Which leads to a government run by few and influenced only by those with power. You hit is right on the head when you said “in the haze of manipulative ad campaigns, it is very hard for them to assess how their votes will correspond to getting the government they want.” I believe this is the main reason youth don’t vote and some adults as well. Great post! every thought provoking! Thank you. I think you have a good point. The overall persepctive I presented does ignore the psychological effect of disenchantment, either because people think there’s a lot of fraud and elections are rigged, or because people feel marginalized and disenfranchised. In other words, it’s not just important that the will of the people be expressed, but that the people feel it is being expressed. I believe really strongly that politics matter, that what the government does affects all of our lives, and that who is in government affects what government does. I also believe that the average person – as you point out so well – simply cannot put in the time and effort to be adequately informed about every issue, and thus to make a reasonable choice. And this is particularly hard for young people, who have had less time and experience to think about how what’s happening in the capital affects their lives. Have you heard about the Mexican elections right now? I think I will post about them tomorrow so if you get a chance to stop by and read I would love it! I know just a bit – I haven’t followed the details, but would love to learn more, so I will look forward to your post.